The 2.2 SkyActiv-D (the SH-VPTR and SH-VPTS) is the 2.2-litre turbo-diesel engine that is based on its predecessor — the MZR-CD. The main difference is that the new engine has the reduced compression ratio. It dropped from 16.3 to 14, and this number is pretty low for diesel engine and almost the same as SkyActiv petrol engines have. Lowering the compression ratio to 14 is noticeably dropped the temperature and pressure in the cylinder. That increased the efficiency of the engine but worsened the mixing of the fuel-air mixture and its self-ignition at cold start of the engine and its warm-up. Because of this, the engineers had to introduce new ceramic glow plugs which heat the air in the combustion chamber to 1000 degrees Celsius in two seconds. Another system that is rarely used in diesel engines is the phase change system (for intake valves in this engine). Variable exhaust valve lift (VVL) opens the exhaust valves slightly during the intake stroke. Hot exhaust gases penetrate back into the cylinder and increase the air temperature. This technology helps to prevent misfiring during warm-up and provides efficient cold temperature operation. A small compression ratio significantly reduced the load on the engine and reduced pumping losses. Now it became possible to reduce the weight of the main engine components without loosing in reliability. The 2.2 SkyActiv-D engines have an aluminum alloy cylinder block. There are a chain-driven two balancer shafts to offset secondary inertia forces. The 2.2 SkyActiv-D engines have an aluminum DOHC cylinder head, four valves per cylinder, and roller rocker arms. The head now has an integrated exhaust manifold. In addition to reducing the size and weight of the engine, it accelerates the heating of the catalytic converter. The engine was equipped with new fuel system also. All 2.2 SkyActiv-D engines have modern common-rail injection system via multi-hole piezo injectors. The engine was equipped with two turbochargers, combined in one unit. Two-stage turbocharging allows you to connect advantages of large and small turbines. A small turbocharger (high-pressure turbine) has a quick response and produces a high boost pressure at low engine speeds, and a large turbocharger (low-pressure turbine) — at high engine speeds. This unit greatly increases low- and high-end torque (up to the 5,200 rpm rev limit). The 2.2 SkyActiv-D engine had a diesel particulate filter (DPF). Without a filter, as all modern engines, it would not satisfy exhaust gas emissions standards such as Euro VI in Europe. To summarize, the new turbodiesel is 10% lighter and 20% more fuel efficient than its predecessor. But the maximum power and torque did not grow up. 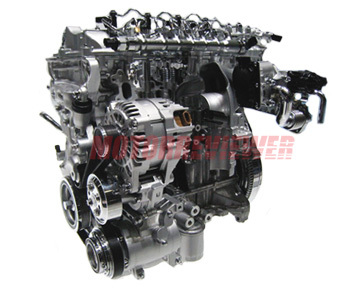 There are no severe statistics of common problems and issues for 2.2 SkyActiv-D diesel engines. Rare facts were registered with an increasing oil level and frequent regeneration cycles. Cars with similar symptoms tend to have high fuel consumption. But it is only possible to assume that there will not be too many serious problems with them since the loads have been significantly reduced.